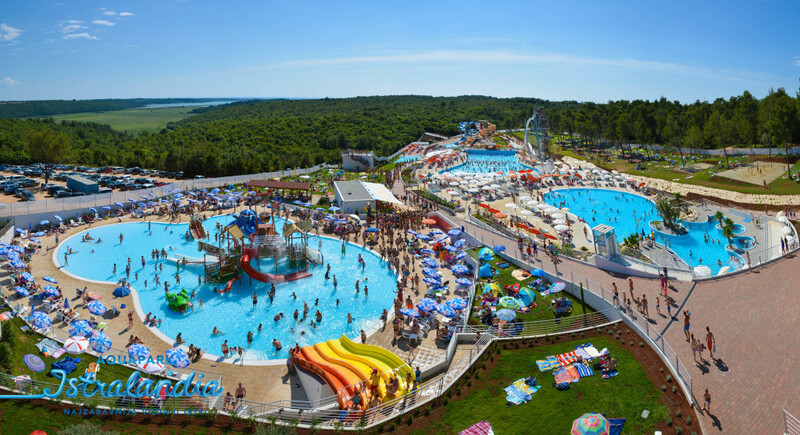 Istralandia and Aquacolors aquaparks are main water attractions in Istria and favorite amusement parks for family trips and vacations. Both aquaparks are located quite near the Čiže resort and it takes just about 30 minutes of driving to get there. Istralandia is set up in Nova Vas (Novigrad) which is around 30 km away from Resort Čiže.They offer high quality entertainment for children and adults including various events such as concerts, tournaments, recreational activities and other fun programs managed by trained personnel. Dive into large pools, try out slides or hydromassages, enjoy food&drink services at Istralandia, aquapark that received 5th place award in the best European aquapark competition by the EAS 2016. On the other hand, Aquacolors in Poreč is the biggest water park in Croatia with a whole series of attractions for children, as well as adults. There are 12 huge toboggans, longest “lazy river“ in this part of Europe (500m), various animation programs, creative workshops, playgrounds, fresh and healthy food and much more to explore at this water park which is also only 30 km awayfrom Čiže Resort. If you’re looking for fun, look no further. Take your family to one of these fantastic “fun factories” and have the time of your life in a clean, safe and comfortable environment. Waterpark Aquacolors and aquapark Istralandia are waiting for you.